ALPA’s history is steeped in our commitment to advancing the piloting profession and to ensuring that airline travel grows ever safer. As the world’s largest pilots’ union, ALPA has advanced the piloting profession since 1931. Throughout the last eight decades, airline safety and security have been at the core of ALPA’s operations. “Schedule with Safety” has been the mission since our Association was founded, and our legacy of championing air safety carries on. It is manifested in the ongoing work and far-reaching contributions of ALPA’s network of dedicated pilot volunteers and staff working with industry groups and government officials in the United States and Canada to ensure one level of safety and security for every airline operation—cargo and passenger. 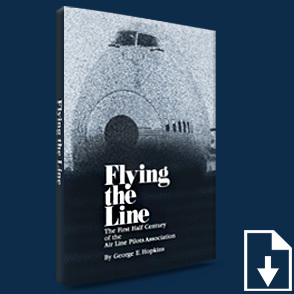 Listen to the Podcast: Join us as we recount an exciting chapter in aviation history and the beginnings of the Air Line Pilots Association, the world's largest pilot union and nongovernmental air safety organization, through an abridged retelling of the book by George E. Hopkins, "Flying the Line." Find it on Apple Podcasts, Google Podcasts, Spotify, or your favorite podcast app. Have a piece of your history? Share it! Email us to find out how to donate memorabilia. Visit our Hall of Past Presidents to learn about the men who have led ALPA over the decades. The 1930s was a decade of great significance for airline pilots across the United States, Canada, and beyond. It was the decade when a professional union of pilots was born to protect the interests of airmen during a decade marked by “pilot pushing,” horribly unsafe flying conditions, and a company mentality that pilots were an expendable commodity. Fly at all costs, under all conditions; just make sure that the mail is delivered on time. During the 1940s, many ALPA pilots joined the fight to preserve democracy as we know it during the Second World War. 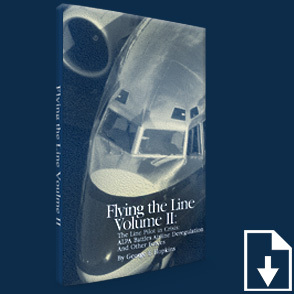 It also was a decade when ALPA first began advocating for the formation of an independent aviation safety board, and one marked by greater pilot cooperation across national borders through the creation of the International Federation of Air Line Pilots’ Associations (IFALPA). In the 1950s, the concept of the modern jet transport moved from blueprint to reality. The advent of the jet kicked off a revolutionary new means of transporting people and cargo. ALPA’s air safety structure also was devised, and the framework established in 1951 has evolved into the largest nongovernmental safety structure in the world. In the ’50s, the issue of crew fatigue and rest requirements, which continues to be an unresolved item on ALPA’s safety agenda today, also became an increasing concern to pilots. Although the late 1950s marked the birth of the jet transport, the 1960s marked the first widespread use of this revolutionary new form of transportation, which created a whole new set of safety concerns. During this decade, the NTSB was created under the new Department of Transportation (DOT) to investigate accidents—an idea ALPA strongly advocated for many years. (The agency severed its organizational ties to DOT in 1975.) And, in the ’60s, ALPA led the way to improved regulations covering aircraft emergency evacuations—the culmination of decades of work spearheaded by a dedicated ALPA safety volunteer, Capt. Vic Hewes of Delta Air Lines. The 1970s marked a difficult time for the U.S. airline industry. The threats of skyjacking became realities and hit closer to home. 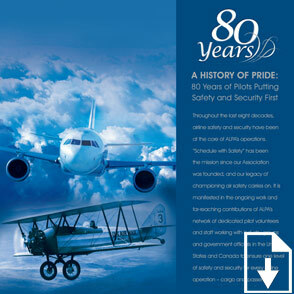 Despite the difficulties, the decade did contain some success stories in the area of aviation safety: ALPA’s Safe Transportation of People (S.T.O.P.) campaign was victorious, the FAA established the first airport certification requirements after nearly three decades of pressure by ALPA, and NASA launched the Aviation Safety Reporting System (ASRS)—an airline incident database that ALPA helped pioneer. ALPA also initiated the first studies on the role of wind shear in airline accidents. The 1980s meant one word to anyone involved in the airline industry: deregulation. The Airline Deregulation Act of 1978 forever changed the landscape of the airline industry in the United States. During the process, three of the “powerhouse” airlines—Eastern, Braniff, and the original Pan Am—went out of business, along with other major consequences of this reinventing of the U.S. aviation economy. Deregulation also created a whole new wave of safety concerns. However, the ’80s also provided ALPA with some long-fought-for safety victories: traffic alert and collision avoidance system (TCAS) requirements for Part 121 operations, passenger “fasten seatbelt” signs in airplanes, adoption of the Association’s anti-skyjacking strategy by federal regulators, and federal approval of crew resource management (CRM) training, to name just a few. During the 1990s, the airline industry had to deal with the aftershocks of deregulation. It also was the decade of several major airline tragedies. However, some of these accidents led to aviation safety enhancements, including the redesign of the B-737 rudder control system, improvements to the ATR-42/72 wing deicing boots, and changes in pilot training on aircraft performance in icing conditions. The crown jewel of ALPA’s safety work during this era was our successful campaign for One Level of Safety, to bring Part 135 operations with more than nine passengers up to the same standards as Part 121 operations. The FAA adopted this standard in 1995. ALPA was part of a team receiving the prestigious Collier Trophy during the decade, for our part in the development of the Boeing 777 twinjet. The airline industry continued to make enormous strides in operational and technological improvements and their effects on safety during the first decade of the 21st century. By 2007, the risks that could result in airline accidents in the United States and Canada had been reduced by more than 70 percent in one decade. Many of the changes, large and small, that brought about the industry’s extraordinarily high level of safety reflect ALPA’s input, advocacy, and engagement with government and industry stakeholders—and a move toward a data-driven, rather than a headline-driven, approach to airline safety. The 9/11 terrorist attacks had a devastating effect on the airline industry. As a result, aviation security issues have been at the forefront of much of ALPA’s activities since then. In response to the terrorist attacks, ALPA has been a leader in the United States and Canada, successfully pushing for the U.S. FFDO program and the Known Crewmember Program, plus RAIC in Canada. ALPA continues to address areas of vulnerability in passenger and cargo airline security. ALPA received two Collier Trophies during this decade: one for our innovative work on Automatic Dependent Surveillance-broadcast (ADS-B) and the other as part of the Commercial Aviation Safety Team. In the 2010s ALPA line pilots, supported by professional staff in the Engineering & Air Safety, Communications, Government Affairs, and Legal Departments, continue to press for safety and security improvements across a broad range of issues, from transport of dangerous goods (especially lithium batteries) to laser attacks on airline cockpits to continued implementation of programs vital to modernizing the Canadian and U.S. air transportation systems. Recent successes include direct involvement with the FAA and industry to set (1) rational, science-based flight- and duty-time limits and minimum rest requirements for passenger airline pilots and (2) more stringent minimum qualifications for all airline first officers. Making science-based fatigue rules applicable to all airline pilots; improving airline pilot training and professionalism; and safely integrating remotely piloted aircraft into civil airspace remain top priorities.